This recipe is another “hold over” from my catering days that I prepare from time to time at work. It’s so easy to make, I almost feel bad sharing it and giving away my secret. Everyone always comments on how tender this roast is and wants to know my secret. My secret really isn’t a secret at all. Pork roast is considered “done” with it reaches an internal temperature of 160F. The trick to tender, juicy pork is to remove it from the oven anywhere in the 155F-165F range (at 155F it will keep cooking after it comes out of the oven and get past 160F). Simply purchase a meat thermometer and check the temperature once the roast “appears” done. Overcooking pork leads to dry, tough meat. This really is a simple, fail-safe recipe and it’s perfect for your next dinner party, holiday meal or just to feed the family and enjoy the leftovers. Preheat oven to 400F. Place roast in a baking dish and cover the roast with sea salt and cracked black pepper, the ground cumin and half the garlic (1 tbsp powder or 1 1/2 tbsp fresh minced). Pour 1 cup of wine around the roast in the pan and bake in the preheated oven for 30 minutes, then check the temp with a thermometer and continue to cook until temperature reaches 155F, checking the temperature often to make sure you don’t overcook the meat. Meanwhile, in a sauce pan over medium heat, combine the pie filling, jalapenos, remaining garlic and remaining white wine. Cook until thoroughly heated and well combined. Remove from the heat. When the roast has reached 155F, pour the cherry glaze over the meat and put back in the oven for 5 minutes to glaze the roast. Remove from oven and let rest for 10 minutes before slicing. Slice into “chops” the thickness you prefer. 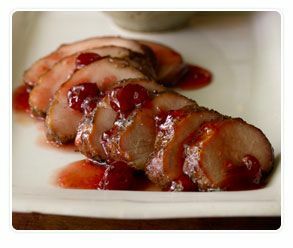 This entry was posted in Entree and tagged cherry glazed pork, grilled pork loin, jalapeno cherry glazed pork, pork loin, pork roast, pork tenderloin, roasted pork by quarlj01. Bookmark the permalink.